VocaParty: [Event Report] Kz(livetune) Panel Session on Day 2 on Comic Fiesta 2013. 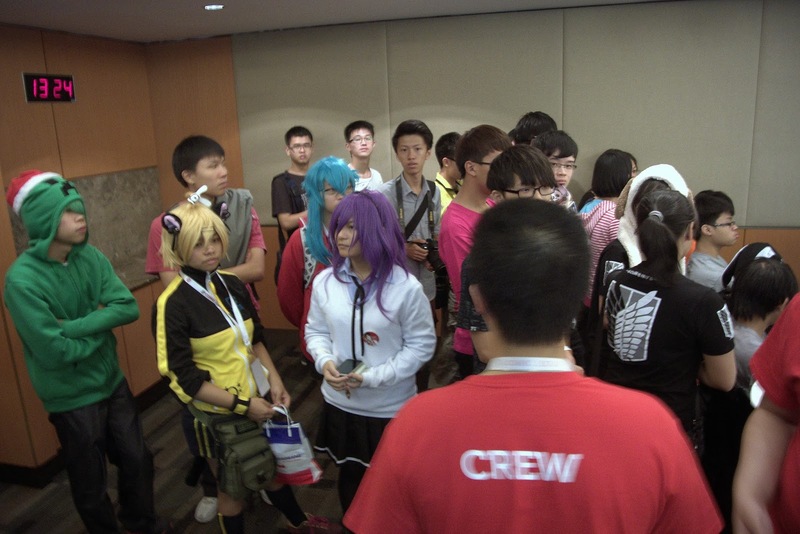 [Event Report] Kz(livetune) Panel Session on Day 2 on Comic Fiesta 2013. The year 2013 has many things happening, whether good or bad. 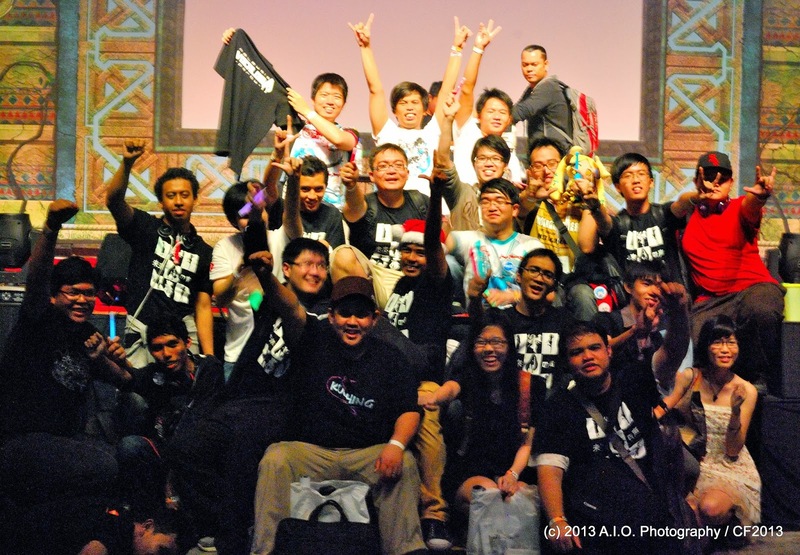 For Malaysia Vocaloid fans, 2013 drew it curtain finely with the arrival of a veteran from the Vocaloid community. 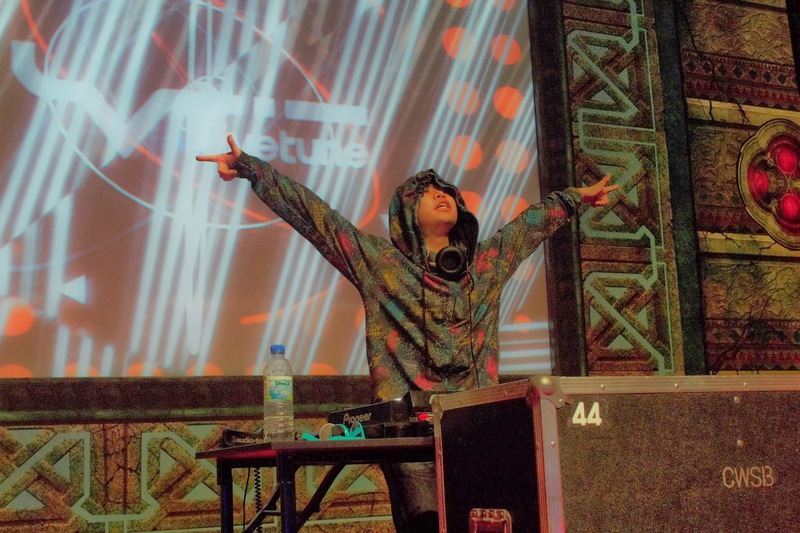 M.V.P was really excited, albeit was informed quite late, but was happy nonetheless when kz(livetune) came to our largest convention yet, Comic Fiesta 2013 not to only as appearance but giving the fans what we always want.....a exhilarating DJ session at the end of the event. 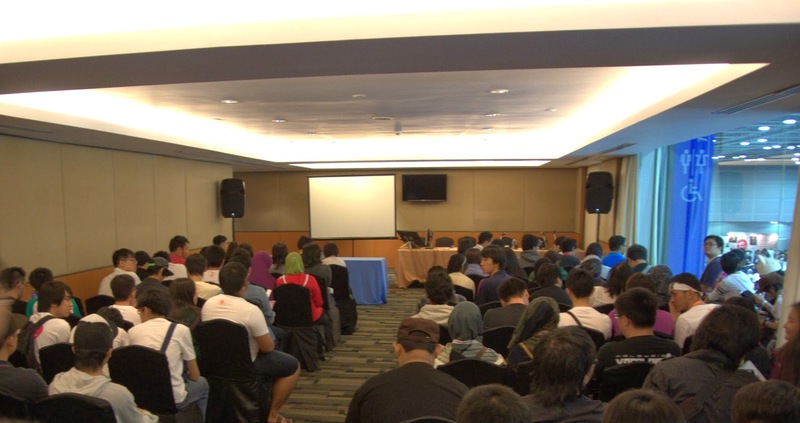 This article will feature the kz's panel session that take place on Day 2 of Comic Fiesta. Please, do have a read. After approximately queuing for half a hour, we barely managed to get into the panel session. Upon kz's arrival, we are informed that we are allowed to take picture and record his panel as he felt very happy with the fan's reception (He is usually camera shy). The line for the panels. 1. Q:How do you get involved in this expertise? A: I first got interested in music, making and producing music when he was in primary school because my experience with music is a concert by Mr Sakamoto Ryuichi. With regard to Vocaloid, the reason I started with it as at the times Vocaloid was first released, I was really big fan of 'Daft Punk", so I wanted to try and use the same kind of effect, same kind of technique, to produce the same kind of music. 2. Q:You make a lot of songs by utilizing Hatsune Miku's vocal. Can you share with us on how do you usually get the inspiration in producing your song? *a question in which he uttered a very long Sou desu ne?" A: Usually I doesn't really go out, so I just stays at home. So I surf, goes online, check some tweets from the friends I have in the music industry. When they tweets or upload new arrangements and songs, I listen to them, in which they inspired me to work harder in my own work. In terms of anime songs, most of the time I started with me actually knowing about the anime itself by reading it, watching it, which then lead to me making songs for certain animes. 3. Q:Among all the songs you created, which one do you really enjoy the most when making it? A: It got to be "Tell your World", as it is a big privilege to be involved with the project as Google and Youtube mostly represented the Internet theme. And because with the Internet I get to experience a lot of wonderful and variety of music, being asked and given the chance to make the song is an honor . That is why, it is the song I have the most fun in making. 4. Q:What is your inspiration in creating the song Tell Your World? A: Actually in the beginning, the Google team already showed me the draft animation and graphics. The final product of the song which is uploaded in Youtube right now, is not really much different from the draft that I have been given. I can feel the emotion and felt very passionate by watching the draft animation video itself, and the inspiration just hit me. I think it because the Google team that approached me is very understanding and passionate toward Internet and music, which resulting a draft of animation that does not differ much from his style and way of thinking. There is not a lot of gap between them and me, which make it easier for me to create the song. For that, I am very thankful. 5. Q:As you created many songs, what is your main software used to produce them? A: There are many different kind of software that I am actually comfortable with, but the main, of course would "Evertune live" and Autotune, hence the name livetune. 6. Q: When it come to produce music , do you produce the vocal first or the muisc track? A: Previously when I fist started, I usually make the track first. Recently however, as I am able to play the piano, I started creating the melody and the lyric along at the same time. 8. Q:How many instruments can you play? A: Piano,guitar and drums, but I am not very good at it though. Recently I played guitar a lot more by himself. 9. Q: Does your song reflect your personal experiences or other person and environment as well ? A: As mentioned before, I doesn't really go out much and mostly stay at home. So I don't have many experiences with regard to the outside world. So usually, I tried to incorporates imagination to scenery and places I have never been before. Rather than the scenery that current existing in this world, the image in my head is more toward illustration wise as I really like illustration that is very rich in background. When I saw those kind of scenery, I felt like wanting to be in there and that's what I want to show in my song. 10. Q:Do you have any idols you look up to or inspired by, as you been involved in the music industry for a while? A: I am really a big fan of rock n' roll, not only within Japan but also overseas artist such as John Lennon and Daft punk. House music also is a big source of my inspiration. When it come to anime world, I am a very big fan of Kanno Yoko, which I dearly respect. And of course, there is also many others. 12. Q:Being here now in CF, what kind of comparison you can feel and see as to other convention you have been? A: Until now, I have been to many events in Japan and overseas. I felt as I am here today, I think CF as compared to others is the closest to what we have in Japan which is Comiket. Based on the goods selection here, I think the one that is popular and main selection are Japanese oriented. It is also the first time for me to see "dakimakura"/hug pillows outside from Japan *laugh*. And based on my past experience, I think this is probably the panel that the most guests that wanting to see me. 13. Q:Will you ever come to Malaysia again to perform? *followed by chanting of Yes* A: *answered in English* Of course! 14. Q:Do you have anything else to say to your fans? A: This is the first time I have been in Malaysia, and although the DJ live haven't started yet, I can feel the passion and the heat from all of you, so I felt like coming again to perform in the future. Thus, please look forward to the live and give your support. Thank you. 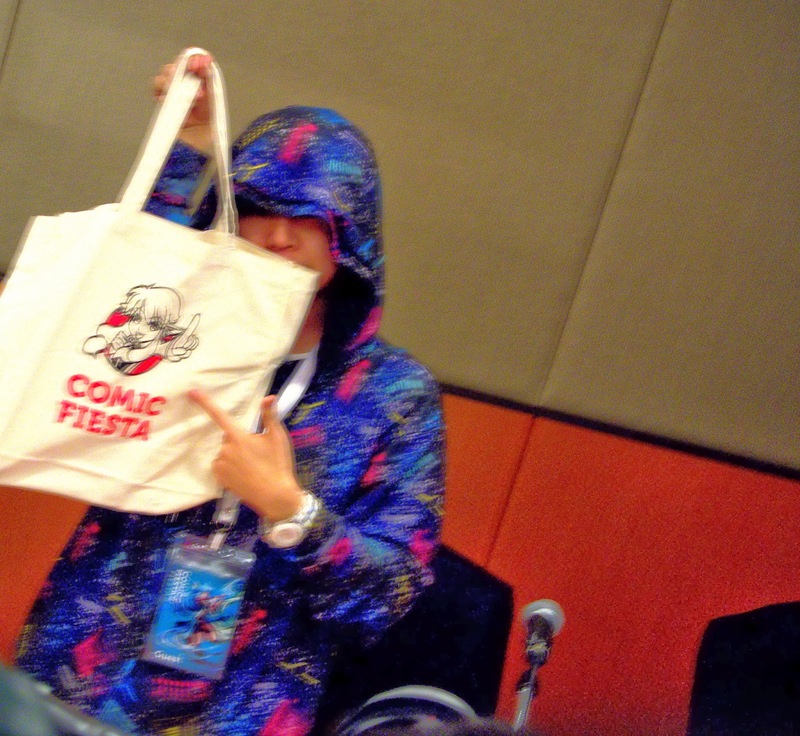 Kz(livetune)'s Picture as he hold the gift bag from CF staff. Credits to all members of MVP especially Azlan Shah, A.I.O and Il terzo for helping with the article as well. And shout out to all fans, remember the awesome night we had last year and pray we shall experience the same, if not better CF Last Night this year as well. Cherios. Thanks for MVPers for making it an awesome night! Kz rocks! !